This endpoint returns all the cdr's the user has generated on their account. There are 2 parameters, simply fill these in with a number of pages you would like returned & the amount of result per page. Once you've done that, hit "Try It Out". 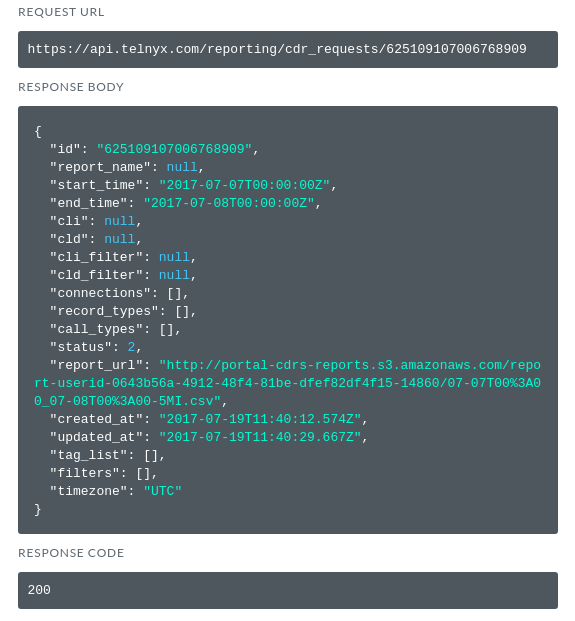 You will receive a JSON response similar to the below with the details of all your generated cdr_requests associated with your account. 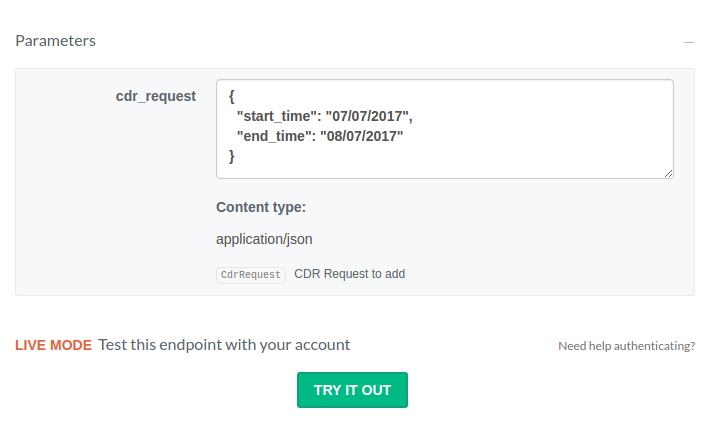 We can use the create a new cdr_request endpoint to add a new cdr_request to one of our IP connections. If we navigate to the endpoint there will be an example of the JSON body on the right hand side. Click this to copy it into your parameters box. The field "start_time" is mandatory. Edit your message body with your new cdr_request details. 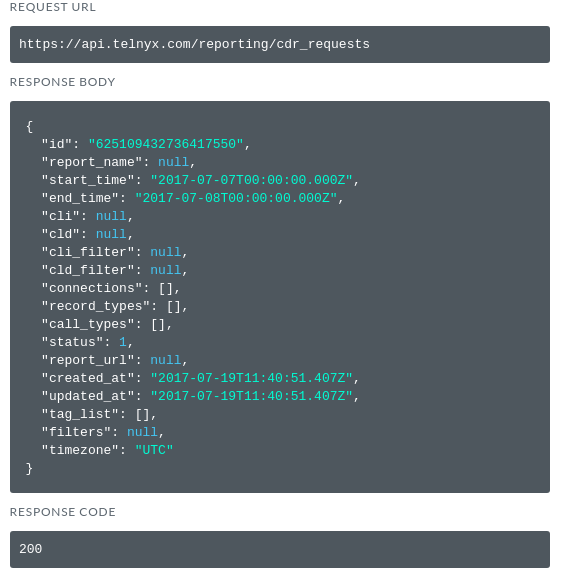 Below we can see an example of generating a cdr request for the 7th of July 017. Note: The first object in the filter list must specify a filter_type of "and". You can not follow an "or" with another "and". Other than that, you can specify as many filters as you like in any order. 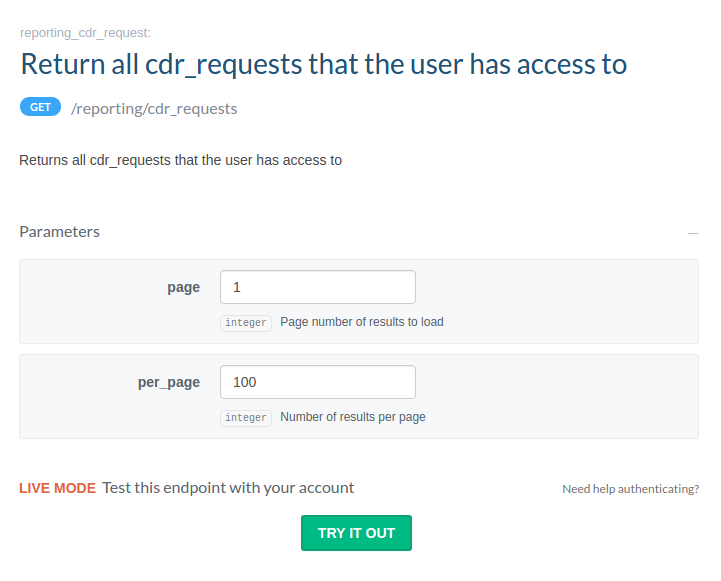 We can use the delete a CDR Request endpoint to delete a CDR Request from our profile. 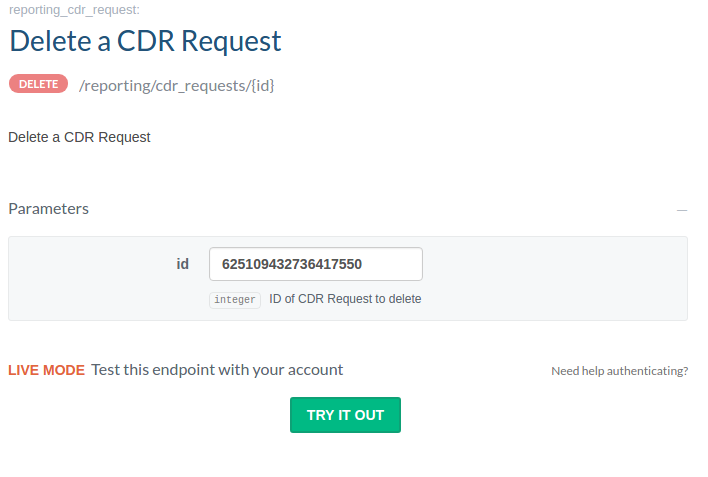 In order to delete a CDR Request, we will need to pass CDR Request ID as the parameter. 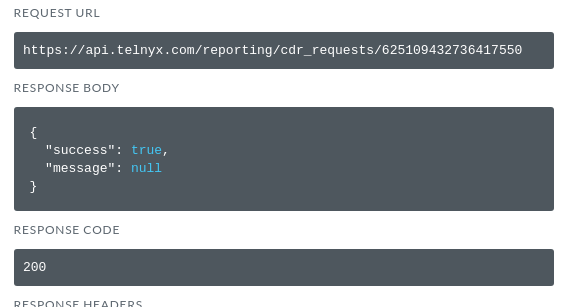 If you do not have your CDR Request ID, you can acquire it by using the "Return all cdr_requests" endpoint above. Once you have you ID, enter it into the "id" box and click "TRY IT NOW". You will get a response similar to the one below letting you know if your request was successful or not. 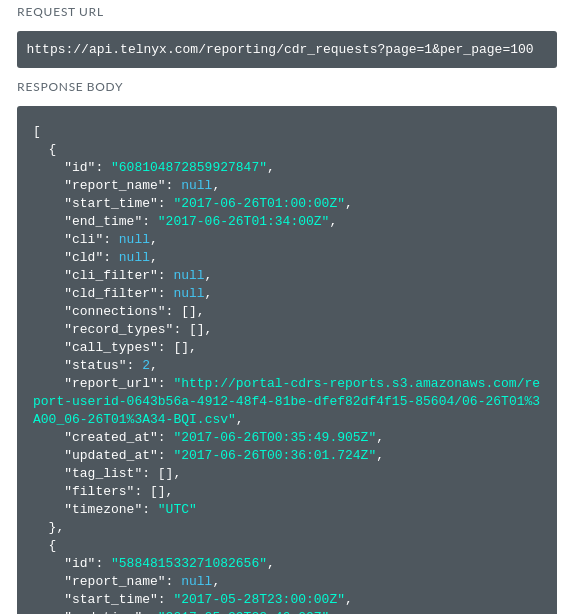 We can use the Get the status of a CDR Request endpoint to get the status of a CDR Request on our profile. 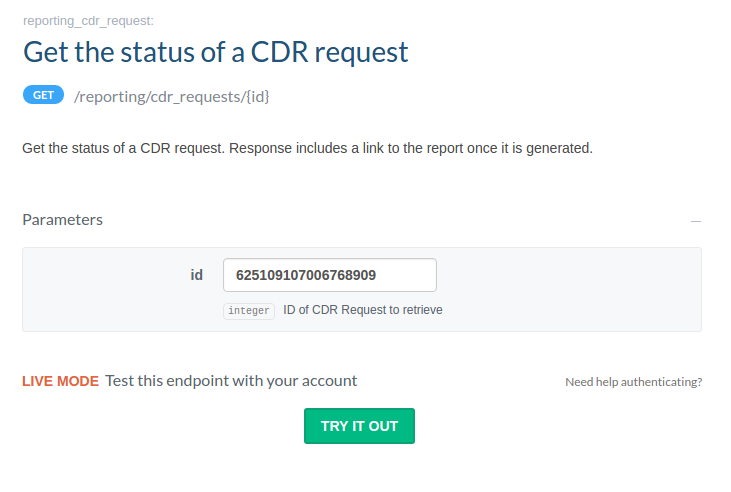 In order to get the status of a CDR Request, we will need to pass the CDR Request ID as the parameter. If you do not have your CDR Request ID, you can acquire it by using the "Return all cdr_requests" endpoint above. Once you have you ID, enter it into the "id" box and click "TRY IT NOW". You will get a response similar to the one below letting you know you the status of your CDR request.